A CFD is an over the counter derivative contract, under which two parties agree to exchange the difference between the opening and the closing value of the contract, with reference to an underlying security that is traded on margin. In other words, CFDs allow traders to speculate on the rise or fall of exchange traded securities, for example, without needing to own the underlying security. 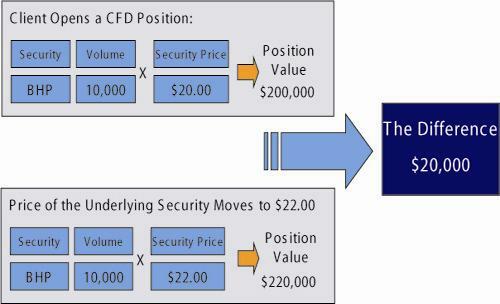 As CFDs are a leveraged product, you are required to deposit a certain amount of cash as collateral for exposure to the CFD position, rather than paying for the full value of the underlying position. For example, when trading CFDs, you can leverage at a ratio of 10 to 1, which means for every $1.00, you can gain exposure to $10.00 worth of CFDs. Therefore, CFDs offer a potentially larger exposure to the underlying security given that investors can outlay a small amount of capital to secure exposure to the underlying security. Of course, this has the effect of magnifying any profits or losses, and consequently carries significant risk, which we discuss in more detail shortly. Remember, when trading CFDs you are leveraging your position, therefore you are using a small amount of capital to gain exposure to a larger position in the underlying security. The “difference” (in Contracts for Difference) is the profit you receive or the loss paid for the privilege of speculating that the underlying asset will rise or fall. For example, if you believe the underlying price of BHP will rise from $20.00 to $22.00, you may decide to take a long CFD position on BHP. As shown in Figure 1, below, the “difference” is $20,000 or the increase in the underlying share of $2.00 (with the price rising from $20.00 to $22.00) multiplied by the number of CFDs held, which in this case was 10,000. Unfortunately, many traders believe they are leveraged in the physical market when trading CFDs but this is an incorrect assumption. When trading shares in the physical market, you own the shares and all the rights that go with ownership, including access to franking credits. When trading CFDs, however, you don’t own anything; instead you pay to receive exposure to the movement in the physical share price. The example in Figure 1, above, demonstrates that while you can make money 10 times faster when trading CFDs, you can also lose it 10 times faster. For example, if the share price had fallen by 10 per cent instead of rising, you would have lost 100 per cent of your capital plus costs. Therefore, it is imperative that you consider the risks should the share price go against you. Know where and how to learn about CFD trading. You can use a guaranteed stop-loss facility (by paying a small premium to the CFD provider) to minimise any losses (although I explain later why this is not the best strategy). As already mentioned, when trading CFDs, you can trade the market both long (a rising market) or short (a falling market), which means you can exploit both trading and hedging opportunities from the price of a security increasing or decreasing. The downside risk of this is that any adverse movement in the underlying price of the security can give rise to large losses, given that you are holding a leveraged CFD position. It is for this reason why we would discourage you from investing in CFDs unless you are experienced in trading the underlying security. Unfortunately, those attracted to trading CFDs or other leveraged markets, such as Forex, are often the ones with very little capital who can least afford to lose their money and, very little knowledge or experience in trading overall. If you have ever traded leveraged markets, you will have come across the statistic that around 90 percent experience a few winning trades interspersed with large losses, and only last around 6 to 12 months before giving up altogether. Therefore, my advice is not to become a statistic because the market will always be there, but you may not if you do not gain the skill to trade any instrument in any market direction. Given that some of you won’t hear what I am saying until you experience it for yourself, what follows are a number of trading strategies you need to consider if you decide to trade this instrument. Regardless of the instrument or time frame you are trading, your money management rules are the most important element in trading to ensure you protect your capital on each and every occasion. Note the rules that follow not only apply to trading CFDs, they also apply to trading Forex. In my four golden rules to investing, I always advocate that you should never use all of your available capital when trading leveraged markets. As a general rule of thumb, you should only trade 10 percent of your total capital in leveraged products and allocate the remaining 90 percent to trading a medium to long-term portfolio of lower-risk investments, such as blue chip shares. When deciding on an acceptable position size for a trade, you need to look at the risk you are taking with your money rather than the amount of leverage your capital will provide. You do this by calculating your stop loss and working out the amount of money you will lose if you get stopped out of the trade. If the amount is outside your tolerance to risk, you need to reduce your position size until the amount is within an acceptable risk level. As a rule of thumb, I always apply a rule of no more than 2 percent of my total capital. So let’s look at an example. Let’s assume you have a total of $100,000 in capital to invest and your money management rules state that you are willing to place 10 percent in high risk trades, which means you are willing to allocate $10,000 (of your $100,000) to trade CFDs. You now need to break this amount down into an acceptable position size for each trade. My golden rules for investing state that you should never invest more than 20 percent in any one position, which, in this instance, means you will be risking $2,000 on each CFD trade. And given that each trade will be leveraged 10:1, your $2,000 would allow you to take a CFD position worth $20,000. By adhering to my golden rules means you will remain within the allowable risk level of exposing no more than 2 per cent of your total capital of $100,000 ($100,000 x 2% = $2,000) in any one trade, which would therefore only have a marginal effect on your portfolio if the trade moves against you. A stop loss needs to be set for the market you are trading. Do not assume that the stop loss you set when trading the underlying share is the same stop loss you would use when trading CFDs. In fact, assuming this will cost you a lot of money. Remember, when trading highly leveraged markets, you can lose money at a rate of up to 10:1, therefore a 5 percent fall in the share price could mean a 50 percent reduction in your capital. That said, it is important when setting a stop loss that it is close enough to protect your capital yet far enough away to allow the trade to unfold. We look at how to set a stop loss when trading CFDs in the next section. While some CFD providers allow you to place automatic stop losses, I strongly advise against this if you are trading with a market maker because you are telling them where to take out your position. In other words, you are giving the market maker the upper hand to pull the spread to wipe you out. While they will tell you this doesn’t happen, believe me when I say it does – that’s why they call themselves market makers. Now that you understand the importance of money management, let’s look at the trading rules you could apply to trade CFDs. When deciding which rule to apply, you firstly need to determine the potential length of the trade. In most cases, CFD trades will last somewhere between a few days and a few weeks. Given this, and the fact that CFD trading is highly leveraged, you need to use entry and exit rules that will enable you to respond reasonably quickly. One of the most effective rules I have found that works well when trading CFDs is Gann’s counter-trend theory. A counter trend is a movement in the opposite direction to the prevailing trend. Gann states that a counter trend is one to four bars or seven to 11 bars. Figure 2, below, illustrates a stock that has five bars (daily or weekly) moving in one direction followed by a movement of two bars in the opposite direction. From this point, the stock turns and moves up in price in the same direction as the original five bars. Once this occurs, we can assume that the two bars that moved opposite or counter to the original five bars was a counter trend in the overall trend. The first five bars, however, are part of the trend and not part of the counter trend, as five bars falls outside of Gann’s Theory for counter trends. In a counter-trend move, your entry for a long position (buy) is triggered when price trades $0.01 above the previous bars high following the counter-trend, as marked on the second last bar in Figure 2, above. 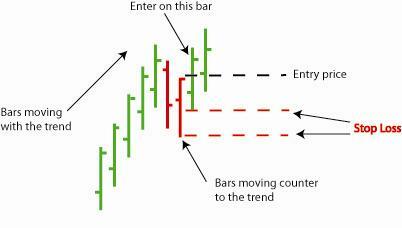 I have also marked two stop loss points in the event the trade does not move in the direction you expected. The lowest stop loss is $0.01 below the low of the preceding bar (where the entry was triggered) and the upper stop loss is $0.01 below 50 percent of the preceding bars range (where the entry was triggered). The reason I have marked two stop loss points is that you can use either, once you enter a trade, depending on the risk you are willing to take. For example, if you choose to place your stop loss $0.01 below the low of the preceding bar, and this equates to a risk level of more than 2 percent of your total capital, you can either reduce your position size or bring your stop loss up higher. That said, be careful that you don’t raise your stop loss too high, as this may result in you exiting the trade too early. Now let’s briefly discuss how you would manage your trade. Unlike options, CFDs are not affected by time decay; therefore, you can use the same entry and exit rules as you would to trade shares. Obviously, when trading a leveraged instrument, your exit is far more important and needs to be managed diligently, so you can exit quickly in the event the trade moves against you. Remember, any move up or down is amplified at a rate of 10:1. It is also important when trading CFDs that you manage your trades on a regular basis to ensure you exit as soon as the trade confirms there is a high probability of a change in the direction of the trend. I cannot stress enough how important it is to get your exit signal right when trading CFDs, simply because if you exit too early or too late, it can have a dramatic effect on your profits and your losses. 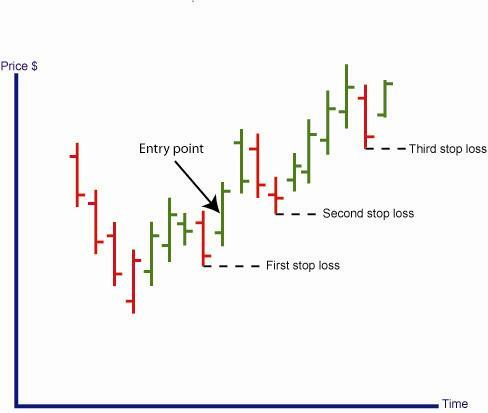 A good strategy to adopt, once you enter a trade, is to bring your stop loss up under each successive trough as shown in Figure 3, below. Your exit would then be triggered once the stock closes $0.01 cent below the preceding trough (low). Notice, in Figure 3, below, we entered the trade on a counter trend and placed the first stop loss underneath the low of the preceding bar. After entering the trade, price rose for two bars before completing a two-bar counter trend, creating a new trough and the necessity to move our stop loss up underneath the second trough. Once again, price rose for another four bars, before falling for one bar to confirm a third trough and the opportunity to move your stop loss up again. You would continue to apply this strategy until you exited the trade. So there you have it. While I have provided you with some effective strategies for trading CFDs, there many other ways in which you could trade this instrument. I have kept this example simple to demonstrate what could be achieved if you have the patience to stick to a plan. If you do decide to trade this instrument, I recommend you develop your own trading plan and back test it using a weekly chart. Learn more about our Forex and CFD Trading Course and how you can profitably trade highly leveraged markets. You can also check our what our clients have to say about their success in the stock market by viewing their reviews and testimonials.